I have more than just tips on homemade flea control, check out more links for pets at the end of the page. The advantages of using homemade flea control methods far outweigh the chemical substitute when trying to rid your pets and home of fleas. These are natural flea control recipes that work. Go outside or in the garage and use a fine tooth flea comb (Wal-Mart has them), to get rid of any additional live fleas and eggs. It's good to do this over newspaper so you can roll it up and burn it. Fleas are not prejudiced, they like anything warm and moist. If you want something that leaves your dog's coat shiny at the end, try this recipe. Bathe your pet with homemade flea shampoo and leave it on as long as you can; approximately 5 minutes or so. Pour the mixture into bottles and use in the same way you would use the Dawn soap. 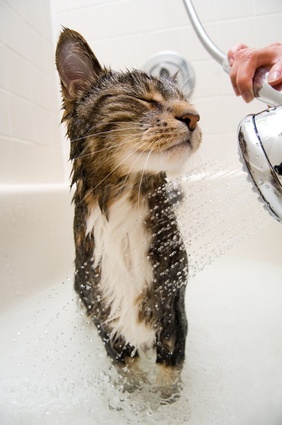 Make sure you leave the suds on for five minutes before rinsing to ensure the fleas have ample time to suffocate. If you want to repel fleas, ticks and mosquitoes, add a few drops of lavender oil to the shampoo mixture. Lemon oil and peppermint are also effective. Learn How to Get Rid of Fleas at this informative website. It's more in depth and has great tips. Mix all ingredients until everything is dissolved. Pour into clean bottles. When washing your dog, allow the suds to sit for at least five minutes before rinsing. The citrus and lavender oils will repel fleas for days following the bath. Roll up your pet's bedding and take it outside to shake. Then wash in the hottest water that fabric can stand without ruining it. Vacuum this area thoroughly to get all fleas and eggs. Another homemade flea control tip: If you do not live in a humid area, sprinkle salt in the carpet to stop the flea cycle. It dries out everything and fleas will die. If you live in a humid area, the salt may damage your carpet. To control the fleas in your back yard, you can purchase a beneficial nematode which you simply spray on the ground. This is usually available for purchase at your garden store or online. These tiny parasitic worms feed on and destroy flea larvae (yeah!). Spray only in shady areas and reapply if further infestation occurs. If you don't want to subject your pets to harsh chemicals, a natural homemade dog flea shampoo will help prevent and treat fleas on your dog and in your home. Many people swear that 1 teaspoon of brewer's yeast will keep fleas away. I use it to make homemade dog treats, and it's good for them too - rich in B vitamins. I found tablets at Wal-Mart for $7.88 - just crush them to make the dog treats. Here's another option. Before you bathe your pet, bring a pot of water to a boil and add 1 teaspoon of dried rosemary to the boiling water. Take off the heat and let cool. It's bath time. After scrubbing him down, have him sit down in the water for a good 10 to 15 minutes if you can. This will drown the fleas that were underwater. Rinse your dog well and your final rinse should be with the cooled rosemary water. Homemade flea control doesn't have to be difficult. By taking preventative measures, you ensure the happiness and well-being of both your family and pets.